FIT PAST – FUTURE PERFECT? Conservation: a key to sustainable design. The 2009 Annual School is an exciting opportunity to focus on the impact of climate change on the historic environment and to look for practical solutions to promote the sustainability of historic buildings. This year’s Annual School looks at the challenge of climate change and examines ways in which we can respond positively. The School will provide the opportunity to hear about current initiatives and new approaches; to gain insights from recent projects; and to consider ways of adapting and enhancing our historic environment in the future. The programme of seminars and site visits is designed for all professionals working in the historic environment, in planning, architecture, urban design, heritage management, landscape or in other conservation projects and initiatives. The School welcomes people working in national and local government, private practice, education and voluntary bodies. The Annual School will bring together speakers from many backgrounds to talk about the potential impact of climate change. It will develop practical solutions to protect and adapt our historic assets and address climate change for the future. 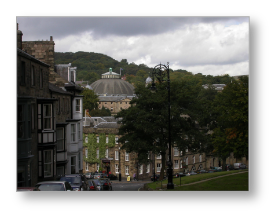 The Annual School will be held in the historic spa town of Buxton, at the heart of Derbyshire’s Peak District, that combines stunning scenery with magnificent architecture. For more information visit www.visitbuxton.co.uk. The main venue for the School is the 4 star Palace Hotel. Places are limited so delegates should book as soon as possible. Special rates are available to those booking before 10th April. Booking is on-line by clicking on the link on the left, but if you prefer you may also book by telephone on 0131 558 1854.